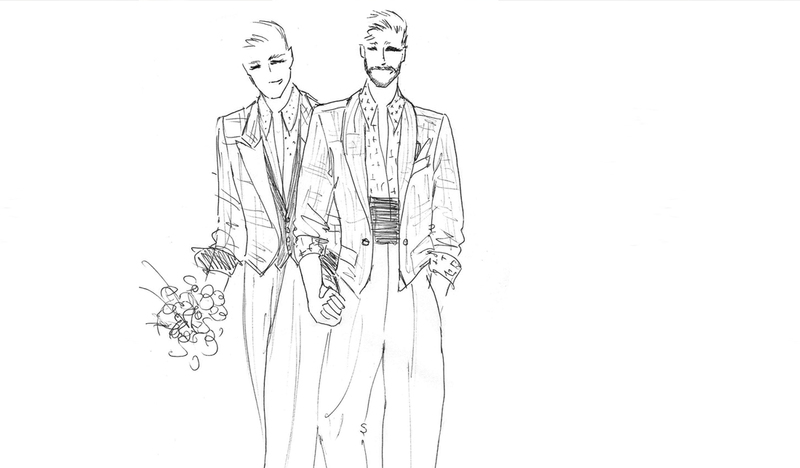 Help – what should I wear for my gay wedding? When two guys get married, they will often opt for wearing matching suits. That is a great look and works for most, but of you are not a standard shape, do consider getting your suits custom-made. It may be a bit of an investment, but the fact that the suit is styled to fit you perfectly will make you both look and feel great on the day, and of course you have the option of wearing your suits again in the future if you choose to. Whether you decide to go for matching suits in the same fabric and colour, or suits in similar styles in contrasting colours, you can of course ring the changes by adding in some stylish accessories that show your loved ones that you are a couple – think of matching waistcoats, one partner in a bow tie and the other wearing a matching tie, or mixing and matching trousers and jackets to present two halves of a whole – you can use your imagination! 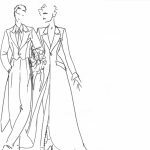 Depending on your budget, you may decide to opt for completely bespoke wedding outfits, or pair some off-the-rail pieces with just one custom made jacket for instance. Some couples decide to treat the best man or best woman, or even the whole wedding party, to a suit which fits in with the style of the day. Even if you don’t want everyone to dress the same, you can find complementary outfits that will fit in with your special plans. Whatever you decide on, remember to leave plenty of time to get your outfits made if you decide to go for custom made gay wedding outfits – many months can pass between the original concept and the final fit, but the effort will be worth it when you look back on pictures of your special day!